Let me know what happens, Andy. Good luck! There is a Facebook group for my hometown from high school where the admin does the same thing: finds old photos and takes new ones at the same location, same angle. It’s fascinating! Very cool. Is it one of the “Vanished” groups or a different one? Vanished Kalamazoo is a wonderful group moderated by an excellent and very knowledgeable moderator. I’ve heard of FB groups like that one, too! Is the walking mall still there? I heard it was torn down. I once rescued a pigeon that had flown into a window and took it to my dorm room in a cardboard box. Imagine my surprise when I opened the box to realize it had recovered and was NOT happy about its confinement. The mall was reopened quite a few years ago. Times change . . . . Aw, that poor bird. But you did good to try to help it! We have a “pigeon lady” in Phoenix who takes care of sick and injured pigeons and nurses them back to health. The bird was good as new (after she shrieked and scared me to death) and flew out the window. 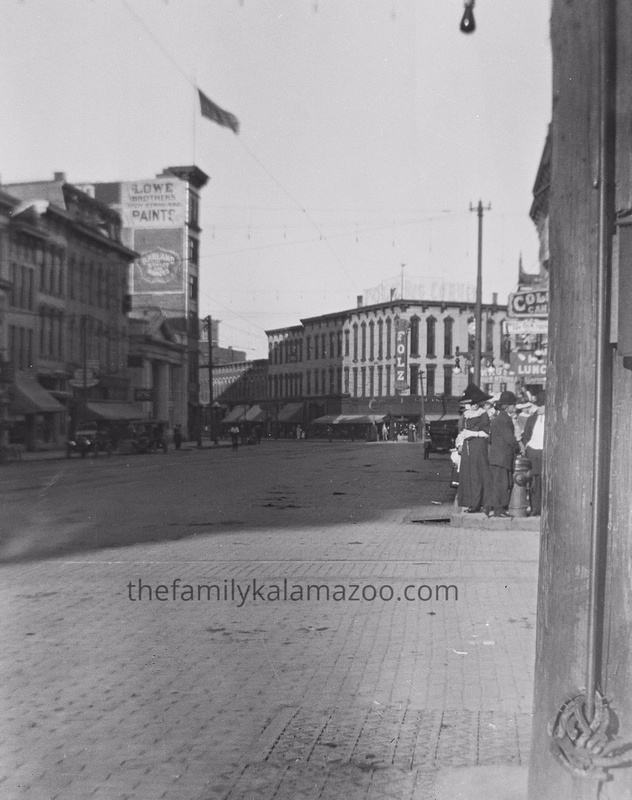 Were you from Kalamazoo or did you go there for college and leave afterwards? Curious minds ;). The latter. Born in California, raised in Flint, went to school in Kalamazoo. But the plot does thicken a little; in the late 1870s my family lived in Otsego area … Kzoo was the train station and big town. My grandpa (born 1920) remembers his parents putting him on the train in Detroit, and his grandpa picking him up from the Kalamazoo station in a buckboard wagon. Names would be Kelly and Wolfe. Oh, that’s such a cool story! So you already had a connection long before college! I was in college in the 90s, before all 20 year olds were issued a flashy car, as it seems is the modern practice. 🙂 So I would take the Amtrak home to Flint. The waiting room at the Kzoo station still had wooden benches that looked 1925-30ish, so I used to imagine my grandpa sitting on one, a little blond boy in shorts, and his grandpa coming up the dirt road with his buckboard wagon. Luanne, I am so excited about my new book Southern Perspectives on the Queer Movement: Committed to Home which will be coming out in December of this year! The page proofs are to be sent to me by July 10th., and then I have to have someone prepare the index by the 31st. I already have a gay man lined up for that part of the project. This book is my contribution to history with the intimate first-person accounts of 21 activists who changed the course of the lgbtq community in South Carolina during the 30 – year period of 1984 – 2014. The University of South Carolina Press is publishing, and I think they must have a good feeling about it because they have ordered more than the usual number for a first run. I hope it will be assigned reading for history students. Um, you mean the person who was “sulking around” 😉 that she wasn’t writing and moving was taking all of her time etc was secretly writing a really cool new book???!!!! Congratulations, Sheila! Wow, it sounds so exciting! I am thrilled for you! What a lovely project. I have seen similar things for other cities, and during the 150th Auckland Anniversary Day, there were a couple of huge billboards of old photos actually located in the place where the photo was taken, so they kind of filled the scene. That was very cool! Oh, that sounds wonderful! I hope more cities will do this. So do I. It will help people to understand how much heritage has been lost, and then there might be more effort made at preservation. The idea to take then and now photos is great. Love it. Will keep in mind for my classes! Oh, that’s a good idea! Do you know the WhatWasThere website? What a cool project Luanne! Thanks for sharing.